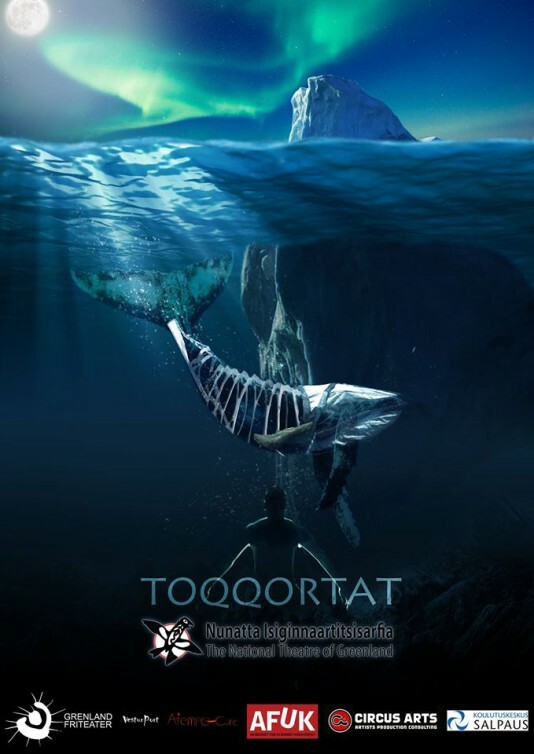 Vesturport participates in the new-circus show Toqqartat in Greenland. In the old colonial harbor of Nuuk, the capital of Greenland, a small army of riggers and technicians has been busy for the last two weeks erecting an outdoor stage – complete with a sound system, lighting, aerial trusses and scenery, including a twenty meter long fire-breathing whale and an Iceberg that has been towed into the fjord to serve as a backdrop. On the 30th and 31st of august a great circus feast will take place with the participation of circus artists, actors and musicians from all over the world. “TOQQARTAT” is a nordic collaboration project led by CEN (Circus effects network – a nordic platform for collaboration between new-circus and theater companies in Scandinavia) and admission is free and open to everyone. More than 40 artists take part in the project along with a large number of Greenlandic participants, among them one of Greenlands pop-music starts Kimmernaq Kjeldsen, along with a choir and a brass band. Taking part on Vesturport’s behalf are Olafur Egilsson and Esther Casey. The participating theatres are Greenlands National theatre, Circus Arts Sverige, Utbrennde Punkare, AFUK circus school Denmark, Grenlands Friteater from Norway, Salpaus Sirkus Finlandi and Attempo Circ from Spain. The project is supported by the EU, Nordisk Kulturfond, Svenska Konstnarsnamden, Letterstedska fonden, Svenska Riksteateret, Helge Axelsson fonden and Royal Greenland.